The Point Data result control item allows you to extract and plot data from your calculation at specific spatial points. This item is usually used to monitor result fields like displacements, accelerations or stresses at specifically interesting locations like sensor points. The Point data items are specified at the simulation setup stage and generate a plot of each desired field quantity over time (or frequency). Each plot data item generates a plot which is accessible in the Post-Processor tab under the tree item Point data. Harmonic response: this type generates a plot of the desired field component over the frequency range, the purpose if this type is to illustrate the variation of the structural response with different excitation frequencies. 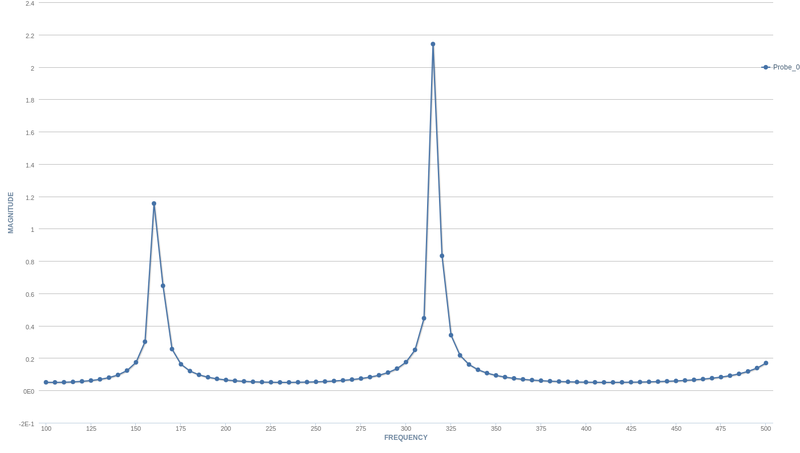 Phase response: the phase response generates a plot of the selected field component over the phase angle, this type shows the evolution of the desired quantity over a specified phase angle range. As the phase angle is directly correlated to the time variable this could be interpreted as an equivalent temporal evolution. Temporal response: the temporal response generates a plot of the selected field component(s) over the time. This shows the evolution of the desired quantity over the total simulation duration. With the Field selection the user specifies the field and its components of interest for which a plot should be created.